The Blanton Museum of Art in Austin, Texas, has become a knitted wonderland, thanks to a site-specific installation led by textile artist Magda Sayeg. 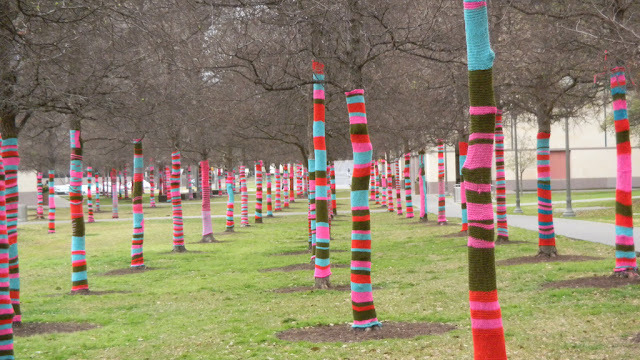 The trunks of all 99 trees in between the museum’s Michener and Smith buildings have been covered with colorful yarn, crafted by over 170 local volunteer knitters. If you're in the Austin area, you can visit the wonderland in person (and perhaps hug a fuzzy tree) until March 18. Thanks for such a cheerful post! Wow, those look amazing! So inspiring to see the things people dream up.